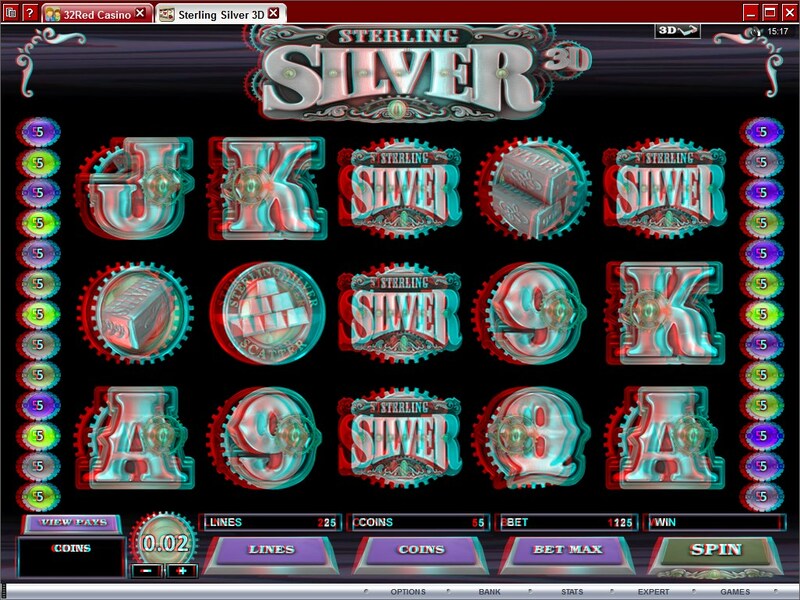 As you might’ve guessed, this is the 3D version of a slot machine called Sterling Silver. There are differences between the two slots, so it’s not just about the 3D quality of the game. The design is largely the same, but it’s now 3D. The features were changed somewhat, but the basics remain the same ones. It’s the only 3D slot machine that I know of, so if you’re curious about how it works you should give this Microgaming slot a try. The game’s symbols form their combinations on 25 paylines, the game having 5 reels to support them all. You can win up to $12,500 by playing on them, with the features consisting in free games, multipliers, scatters and stacked wilds. The game relies on stacked wilds, on random multipliers, scatter symbols and free spins with doubled prizes. These are all great features, and most of them are actually not that common in this form. First, let’s take a look at the stacked wild, which makes an appearance only on the 3rd reel, while in the regular version of the slot is available on all of them. 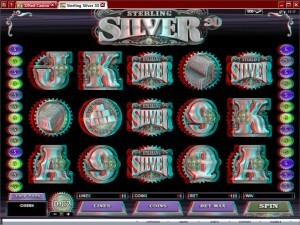 It uses the image of the Sterling Silver Logo. These wilds come with random multipliers, which apply a different value to the prizes obtained with the help of this symbol. Whenever you have a wild symbol in a combo, where it substitutes for another icon, it will give you between 2x and 10x the usual payout. Unfortunately, since it’s available on a single reel it doesn’t offer its own prizes. The image of a Silver Coin is used for the second important feature, the scatter. Just like in the previous title, it’s going to only appear on three reels out of five (the middle three). You need all three to be in place, in order to gain access to the free spins or to the prize, worth 10 times the bet. 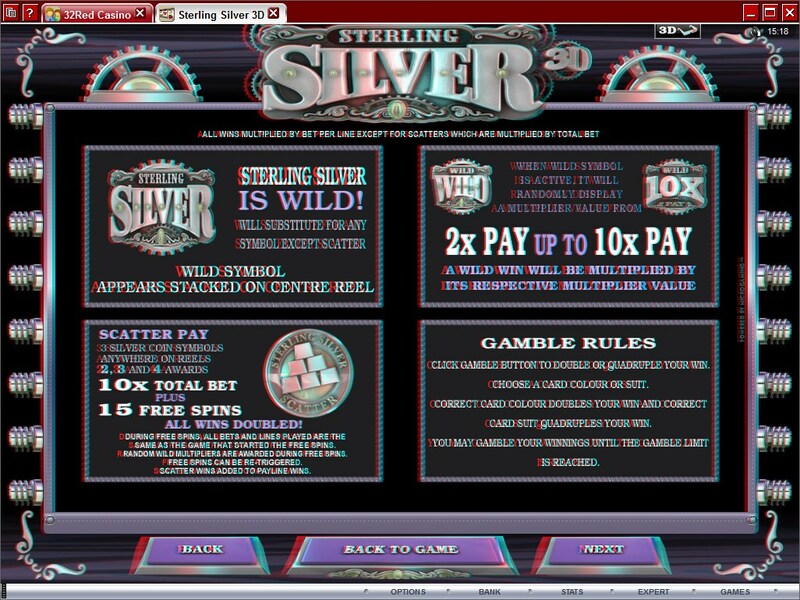 You can expect prizes from the three scattered Silver Coins, but there are free spins to be won as well. 15 free spins are available here, with all the wins doubled. The 2x multiplier wasn’t used in the previous game, but the 3D version looks a bit better in this area. You can use anywhere between 1 and 25 bet lines during each round, but you have to pay to activate each one. You use at least one coin per line to do that, with five coins being the highest line bet. The denomination is another factor that you work with, varying between $0.01 and $0.25. With the numbers I mentioned, the result is a line bet of up to $1.25, while for all 25 you have to wager up to $31.25. The slot’s top rewards will give you 5,000 coins with regular symbols, or up to 50,000 coins when the wild and its multiplier get involved. In the latter scenario that can mean $12,500 cash. You’re going to need 3D glasses in order to be able to play this game, and if you don’t own a pair I recommend you skip it and go for the regular version instead. The theme is silver related, with a lot of symbols made out of this material, showing either steampunk style playing cards or silver made bars and coins. As with the previous game, there is a bit too much silver for my taste, the game simply doesn’t have enough variety. 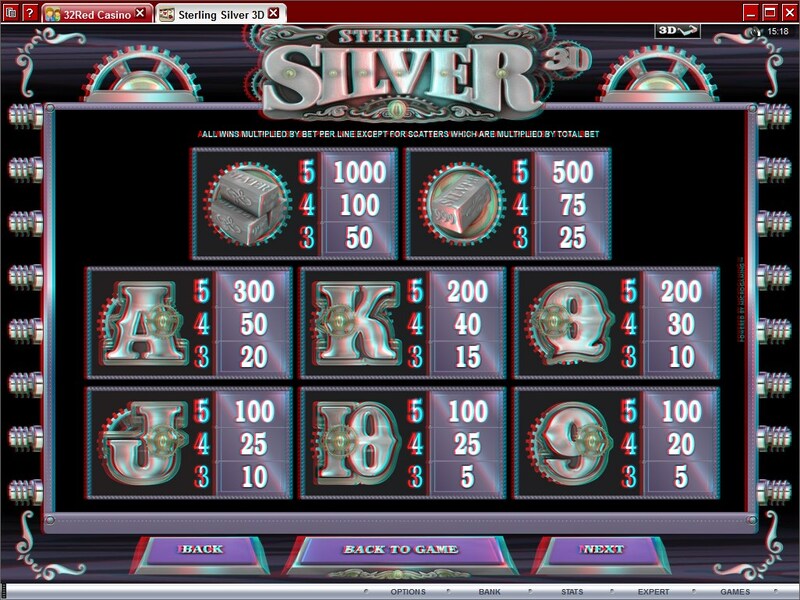 Symbols: Sterling Silver Logo (wild), Silver Coin (scatter), Three Silver Bars (1,000x), One Bar of Silver (500x), Ace (300x), King (200x), Queen (200x), Jack (100x), Ten (100x) and Nine (100x). It’s pretty much the only slot machine to play if you own a pair of 3D glasses, and it’s only playable with that kind of accessory on your nose, so I recommend it if you want to see how such a game would be like. 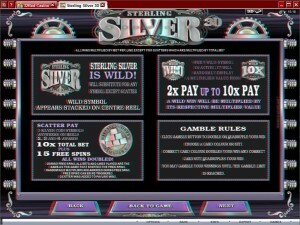 The Sterling Silver 3D slot machine is offered through the Microgaming platform, so if you want to play it for real or just to practice, look out for casinos that use it.